mikeh wrote: ...The particular details I am concerned with--the Fool's testicles, the Pope's assistant's sickle or dagger, and the left twin's tail--are most likely late 17th to 18th century additions to the cards. I have looked but cannot make out what you are describing as the Pope's assistants's sickle / dagger. As far as the tail or sickle, as applied to the "Marseille," we are talking late 17th and early 18th century France ("Chosson" and Conver). If people looking at the old zodiacs then saw Castor or Pollux with the "peaceful sickle" of agriculture, that identifies it with Saturn's sickle, Roman god of agriculture. I think the appelation 'peaceful sickle' is Allen's own description, based upon his own misunderstanding, I don't think we can assume that people of the 17th and 18th century made the same error as he, I have seen no reference or source that anyone of the 17th or 18th centuries identified the sickle of Pollux with Saturn. I have been trying to find out what was known about Castor, Pollux, beavers, etc. in the 15th-17th centuries. 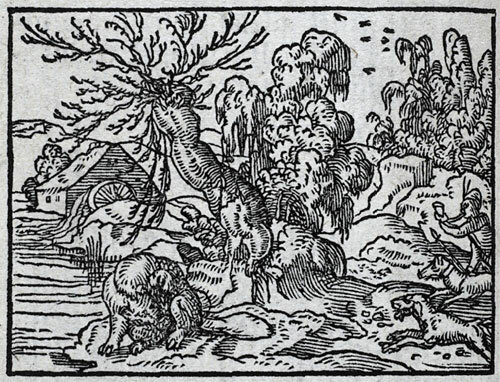 The anecdote about beavers being sought after for their testicles and self-castrating themselves to avoid death, is in Claudius Aelianus's De Nature Animalium, a Roman-era work in Greek well-known in manuscript, according to http://www.summagallicana.it/lessico/e/ ... 20Aelianus. It was published in Latin translation in 1562, according to the title page reproduced on that site. Alciati's book of emblems, published 1556 Lyon, has a woodcut of the beast in the act of self-castration, with a verse and the relevant excerpt from Aelianus. I take this from http://www.emblems.arts.gla.ac.uk/alcia ... id=A56a085. The tree in the background, a cut-off trunk, with humanoid roots and new shoots springing from it, is a standard symbol of rebirth, thus confirming my interpretation of Isadore's beaver, the "Castor," in Italian. Since there are many shoots in the Alciati image, it is probably a symbol for the death of Christ and the rebirth of Christians. At one point James and John even ask Jesus if they should bring down fire from heaven to consume the Samaritans (Luke 9:54). Jesus declines the offer. The Dioscuri were also identified with Peter and Paul, and in Naples the church of San Paolo Maggiore was built on the site of a former temple of the Dioscuri, the columns of which still stood in the seventeenth century, with the statues of Castor and Pollux lying down behind those of Peter and Paul. In the popular imagination they were identified with the Saints Michael and George, and the medical saints Cosmas and Damian (p. 391, citing Le Culte de Castor et Pollux en Italie by Maurice Albert, 1883, pp. 47f, and the Reallexicon fuer Antike und Christendom 1957, entry for "Dioscuri"). The Albert book is in Google Books, but only the first 40 pages. Another book for me to get on Interlibrary Loan. 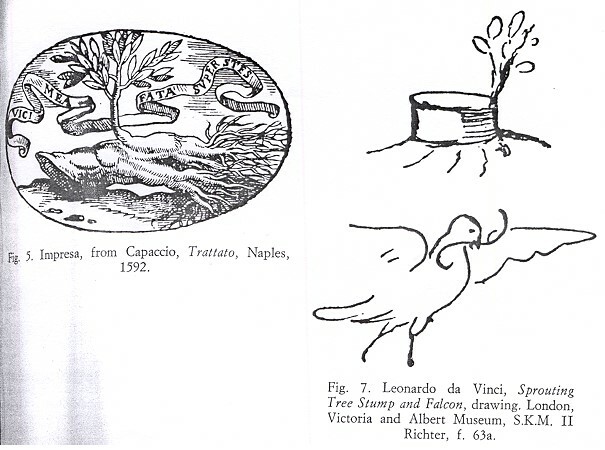 From what I have read so far, the caps can take various shapes, including Phrygian, but they are usually portrayed as ovel: they are to suggest the eggshell from which they hatched, as sons of Leda. If the hats were Phyrgian, they would curve loosely to the side at the top. Three additions to my preceding post. Most translations, including the King James, substitute for Douay-Rheims' "the Castors" something else, either "the Dioscuri" or "Castor and Pollux." However in 16th-18th century France and Italy the Vulgate was still the norm. (2) Cartari includes in his discussion of the "Castori" a section on the meaning of the twins' cap. He says it was a symbol of freedom, ceremonially bestowed upon slaves granted their freedom. He quotes a line from Plautus; in my machine-assisted translation of Cartari that follows the Italian, I have inserted a translation of the line from Plautus rather than Cartari's version, which I could not make sense of. E perciò Catullo in certo suo epigramma gli chiama fratelli Pileati, perche Pileo, che è voce Latina, significa capello in volgare. Pausania perimente scrive, che in certo luogo della Laconia erano alcune figurette Pileate, le quali ei non sa troppo bene se fossero fatte per gli Castori, (che sotto il nome dell'uno intesero gli antichi ambi i fratelli,) ma ben lo pensa. Ne lascierò hora di dire, che'l Pileo appresso de Romani fu la insegna della libertà, perciò che fu loro usanza, che quando volevano dare la libertà ad un servo gli facevano radere il capo, e gli davano à portare un capello. La quale cerimonia era fatta nel tempio di Feronia, perche questa fu la Dea di quelli, alli quali era donata la libertà, detti Libertini. Onde Plauto fa cosi dire un servo desideroso della libertà. Deh voglia Dio ch'io possa hoggi co'l capo raso pigliare il capello. E leggesi, che in Roma, ammazzato che fu Giulio Cesare, furono piantate su le piazze haste con il Pileo in cima, volendo in quel modo chiamare il popolo, e tutta la Città alla libertà di prima. Quando i Romani havevano bisogno di soldati, ò che voleva tra loro qualche uno levare tumulto, e seditione, chiamavano gli servi al Pileo, intendendosi perciò, che à tutti davano la libertà, accioche per quella havessero da combattere. Da che viene anchora, che su certe medaglie antiche di Bruto si vede un capello posto sopra due pugnali, mostrando perciò, ch'egli uccise il Tiranno, e rese la libertà alla patria. E morto che fu Nerone, la plebe in Roma, come scrive Svetonio, e per le Provincie anchora, andava festeggiando con capelli in capo, volendo in quel modo mostrare, che era liberata da grave, e crudele servitù. So putting the Dioscuri in the Sun card might be a way of symbolizing the final freedom of the human spirit, the liberation from the body that comes at the Last Judgment. The part about shaving the head as part of the freedom ceremony for slaves is of interest for the Pope card, so I will discuss it further on that thread. i. For Pindar, a son of God takes on his human brother, saves him from death and lets him share in his heavenly destiny, in so far he also shares his subterranean being. According to the New Testament, the son of God becomes man and suffers – in a person at once God and Man – the fate of death for the sins of others, who in ‘gay exchange’ can share in his eternal life. I have not found any writer in the 16th-18th centuries saying something similar, but the parallel seems straightforward enough. I have found one more text, this one from 1883, describing the use of Castor and Pollux to depict the "Death and Rebirth" theme, first in Roman paganism and then Christianity. It gives some suggestion that the use of the Diocuri in this way was something that would have been known in the Renaissance, in that one example appears in a church in Rome, from the time of Innocent III (12th-13th centuries). Here are two of the concluding paragraphs and my machine-assisted translation. Ainsi, Castor et Pollux apparaîtraient toujours et partout, même sur les tombeaux, comme des divinités bienveillantes et secourables. Ils indiqueraient que tout ne sera pas fini après le coucher du soleil, qu'il y aura un lendemain, et que la journée qui s'achève sur terre sera suivie dans le ciel, où demeurent les grands dieux, d'une autre journée qui n'aura pas de terme. C'est sans doute parce qu'une idée consolante de résurrection et d'immortalité se cachait sous ces représentations allégoriques des Dioscures, que les chrétiens n'ont pas hésité à les adopter pour leurs morts. --Encore aujourd'hui on peut voir à Rome dans l'église de San-Lorenzo, un sarcophage qui renferme les restes d'un cardinal puissant, neveu d'Innocent III, et sur les parois extérieures duquel sont représentés Castor et Pollux, à côté du char du Soleil et de celui de la Nuit (2). Au quatrième siècle de notre ère, on était moins scrupuleux encore. Ce n'est pas seulement comme personnages secondaires de scènes allégoriques, que les Dioscures apparaissent sur plusieurs monuments funèbres adoptés par les chrétiens. On les retrouve aussi, bien visibles et en plein relief, sur des tombeaux dont ils sont une des principales décorations. Tel est, par example, le sarcophage d'Arles (3). Deux scènes purement chrétiens, la Multiplication des pains et la Pêche miraculeuse, ont été ajoutées sur les parois latérales; mais sur la face antérieure, les statues de Castor et de Pollux ont été sculptées par un païen et pour un païen. C'est que la religion nouvelle considérait ces deux personnages bien moins comme des héros grecs ou des dieux romains, que comme de clairs et poétiques symboles de la mort et de la résurrection. Maurice Albert, Le Culte de Castor et Pollux en Italie, Paris 1883, pp. 114, 157, 161. So, Castor and Pollux would appear always and everywhere, even on graves, as friendly and helping divinities. They would indicate that everything will not be finished after the setting of the sun, that there will be the next day, and that the day which ends on earth will be followed in the sky, where live the big gods, by another day which will have no term. It is doubtless because a comforting idea of resurrection and immortality hid under these allegorical representations of the Dioscuri, that the Christians did not hesitate to adopt them for their deaths. - Even today we can see in Rome in the church of San-Lorenzo, a sarcophagus which contains the remains of a powerful cardinal, a nephew of Innocent III, on the outside walls of which is represented Castor and Pollux, next to the car of the Sun and that of the Night (2). In the fourth century AD, they were less scrupulous still. It is not only as minor characters of allegorical scenes that the Dioscuri appear on several funeral monuments adopted by the Christians. We also find them, very visible and in high relief, on graves of which they are one of main decorations. Such is, for example, the sarcophagus of Arles (3). Two purely Christian scenes, the Multiplication of the Bread and the miraculous Fishing, were added on the side walls; but on the previous face, the statues of Castor and Pollux were sculpted by a heathen for a heathen. It is because the new religion considered these two characters much less as Greek heroes or Roman gods, than as clear and poetic symbols of death and resurrection. Maurice Albert, The Cult of Castor and Pollux in Italy, Paris 1883, p. 114. Catalogue descriptions p. 157 and 161. Albert discusses the significance of the bearded vs unbearded men at length earlier in the chapter. Originally it might have mant either youth and old age or death and rebirth. Albert is suggesting that the Christian adaptation saw it as death and rebirth. Another interesting aspect of these sarcophagi is the appearance of Phoebus, the sun god, on many of them (catalogue nos. 187, 188, 189, 190, 191). Albert suggests, for example in the first paragraph quoted above, that the sun represents that which sets but also rises again--i.e. rebirth. The Dioscuri on these sarcophagi are not themselves Apollo and Hercules, from this perspective. When Hercules is depicted on them, he always has his lion-skin (nos. 193, 194, 195). Gosh, the Sun hasn't had much attention in a while. Two questions: (1) Why does the Sun card have Gemini on it? It's different from the Moon card, which has Cancer. Gemini isn't governed by the Sun astrologically or is even a fire sign. (2) Why does the sequence of the zodiac in Minchiate begin in Libra and end in Gemini? In different places I have proposed various answers to the first question, depending on how I work the allegory: Christian, Greco-Roman, Egyptian, etc., comparing famous twins to the crucifixion story. But there ought to be an astrological answer. I have made suggestions for the Minchiate Libra and Gemini in another thread, at viewtopic.php?f=12&t=971&p=14269#p14269. However the tarot image of Gemini on the Sun card seems earlier than the Minchiate sequence. It appears on the Schoen Horoscope of 1515, where all or most of the other images for the Houses seem to pertain to the tarot trumps (see my post at viewtopic.php?f=14&t=942#p14247). Well, here goes.The simplest explanation for Gemini on the Sun is that it develops the imagery already present in the PMB and the Cary Sheet in an astrological direction. Gemini is the only sign with children in it. But they seem older on the Tarot de Marseille, and to be sure in "Sforza Castle", with its man and woman, than in the PMB and Cary Sheet. Also, why in the astrological direction rather than the way, say, the Vieville developed, simply putting the Cary Sheet's boy with a flag on a horse? Answer: the Sun is important astrologically, as is the Moon before it, and the Stars before that. But perhaps Gemini on the Sun card is more meanngful than that. Another explanation for why Tarot Sun card has Gemini on it is that.Dante in the Paradiso enters and leaves the sphere of the fixed stars in Gemini, which he says is his birth sign, The tarot is structured along somewhat Dantean lines. Another explanation might be the same as I gave for Minchiate at viewtopic.php?f=12&t=971&p=14269#p14269. That is, Gemini is the portal by which the gods communicate the liberating knowledge to men and vice versa, in the system of Pontano, 1472-1476. It is therefore closest to the gods, hence highest. Also, in the system of Manilius, on which that of Pontano is based, Apollo is the guardian deity of the Sun. But if that was the answer, then why isn't the zodiac sign on the Moon the one that Diana guards in that system, Sagitarius? These ideas, Pontano's and Manilius's systems, and Dante's journey, may have something to do with why the Gemini are where they are. But what, in the Tarot, do Cancer and the Moon have to do with Gemini and the Sun? I will attempt another explanation. In the allegory of Macrobius's Commentary on the Dream of Scipio, Book 1 Ch. 12, the cave of the nymphs in the Odyssey (as Porphyry had interpreted), contains two gates, one of mortals mortals in Cancer, and the other of immortals in Capricorn. So everyone enters and exits life through Cancer, while Capricorn is the way out for those of sufficient purity not to have to return for another life. But in another way of seeing things, if one has gone through the planets in order in the ascent, one should also go through the zodiac in order, without skipping or repeating any. To do that,one has to leave by Gemini rather than Capricorn. This answer, however, leads to another question. Why is Aquarius on the Star card? Since it's between Cancer and Gemini, you'd think that it should be between the Moon and the Sun cards.. I have two answers. One is that in the book of Revelation, the Morning Star comes first, then it's brighter than the Moon, and then it's brighter than the Sun. This is after the hail, etc. of the Tower card. It's the Apocalypse that precedes the Last Judgment and the New Jerusalem. It's a sequence of ever brighter objects, until the light is brighter than the brightest of the celestials. But this doesn't explain why Aquarius is on the Star card. The second answer relates to Dante's Purgatorio, where the last stop from the top has two streams, one for forgetting your sins and one for remembering your good deeds. Dante partakes of both, in that order. He has to drink from both to enter Paradise. Psychologically speaking, one must first detach frmo the things from this world and forget them; then, frmo that standpoint, the memory of one's good deeds leads one higher. Such are also the two streams on the Star card, appearing there in the C tradition from the Cary Sheet on. Then Dante is in the sky-world of the Paradiso, starting at the level of the Moon, which is the name of the next card in the Tarot sequence. There is also another answer, really another version of the preceding one. In On the Face in the Orb of the Moon (942 to the end), Plutarch has Hades located in the upper air before the Moon. So the soul/spirit combination, after leaving its material part to be absorbed by the earth at what we call Death, becomes like water poured from one vessel to another, as we see in the Temperance card. This last part is in the C order only. The soul/spirit rises through the air of Hades, the Devil card, and then fire, the Tower card, for purification, i.e. Purgatory. At the top is a pleasant area called the "meads of Hades". This is where the two streams would fit, although Plutarch doesn't mention them; they are a later invention, by Dante. Next, in Plutarch, the soul/spirit is on the moon, where there are two "Gates", one leading back to the earth and the other to the side of the Moon facing the heavens. These are like the streams, but on a higher level; they correspond to the towers on the Moon card. Then on the other side of the Moon, soul and spirit separate; soul is absorbed into the moon, while the spirit goes to the sun. That is the Gemini, as soul and spirit sadly separating before the journey to the sun. This last theory, while more complex than the others, also explains more; why Cancer, why Aquarius, and why the sad faces on the Tarot de Marseille Sun card. mikeh wrote: It's a sequence of ever brighter objects, until the light is brighter than the brightest of the celestials. In my opinion, you've interpreted the meaning of this part of the sequence correctly here, Mike. The sequence of ever brighter objects, as well as an atmospheric one - the Lightning Bolt - is sufficient to explain why the inventor chose them in this order to indicate the hierarchy clearly, which is sufficient to recognize the sequence and play the trumps correctly in the game, which is the purpose of the trumps. The rest is decoration, the scenes with people below, the vignettes. Who is sitting in the chariot, what the lightning is striking, what the figures in the space under the Star, Moon and Sun are, who is standing on the World - all of these serve as decorative props, embellishments of the essential subjects. The relationship of some with the subject is clear - e.g. lightning striking a tower, Magi under the Star, astronomers looking at the Moon, or the really pointed one of Diogenes telling Alexander to stop blocking the Sun -, with others the relationship appears more enigmatic - the woman spinning under the Sun, twins which might be Gemini - but these are all incidental, decorative embellishments, which have nothing to add to the "narrative" of the hierarchy, which is simply an increase in brightness and importance. Ross G. R. Caldwell wrote: The sequence of ever brighter objects, as well as an atmospheric one - the Lightning Bolt - is sufficient to explain why the inventor chose them in this order to indicate the hierarchy clearly, which is sufficient to recognize the sequence and play the trumps correctly in the game, which is the purpose of the trumps. Excellent. There are several significant points to this. One is the old observation, noted even by some of the traditional occultists, that the highest trumps depict a hierarchy of light. Another is the fact that such an observation is consistent with the original function of the subjects, to identify and rank trumps in a card game. Despite the emphatic, 21st-century pop-culture claims to the contrary, sequence conveys meaning and meaning was used to make the sequence memorable. The mnemonic requirements are not those of ars memoria being used to convey some esoteric manifesto, but those of a card game. A third point you make, crucial to understanding the "meaning of Tarot", is that there are primary and secondary subjects. The Sun is a good card to illustrate this, and it should be fairly obvious. We can identify 22 subjects as standard, which demonstrates that there were primary meanings. This is despite the variations: a particular subject might be depicted in one deck as a Hermit, in another as a bent old man or Hunchback, and in another as Father Time. In terms of understanding the overall design of the trump cycle, the secondary meanings can only suggest, on occasion, why a rearrangement was made in one part of the sequence, a change from an earlier design. Any iconographic quest for an overall meaning, (either the design of the series in a particular extant deck or the Ur Tarot design, whichever one feels comfortable pursuing), must be based on the primary meanings. For another example, in the trump cycle the Chariot is significantly paired with Love, just as Time and Fortune or Traitor and Death are paired. It is in that context that the primary significance and the cyclic design must be considered. In one particular deck it may also appear to be a reference to Chaste Love triumphing over Cupid's Love card, or to Plato's famous charioteer, or whatever. In the same way, Love may be conflated with Hercules' Choice, as in the Tarot de Marseille design. But as you say, these minor revisionings are little more than decoration, just as Diogenes in the barrel is a charming embellishment rather than a fundamental meaning. Finally, as you have stated it here, your view sounds exactly like that put forward by Michael Dummett. Would you care to make any distinction between his position and yours? For many years I have referred to his view as the null hypothesis: he made very weak claims about the meaning of the trumps, which results in a very strong argument. His view is quite obviously correct, as far as it goes, (but not very explanatory). The burden of proof is entirely on those who would reject his null hypothesis and claim a more coherent meaning. This is his "riddle of Tarot", to make sense of the subject selection and their sequence. As an example, there is my own argument for a sequential design in this section. We can note that 1) the primary subjects of the highest section are all common in Christian eschatology; 2) there are two fundamental triumphs described in Revelation, over the Devil and over Death; 3) the Devil is the lowest card in this section and is trumped by Fire from Heaven, as in Revelation 20; 4) Resurrection from Death and the New World are the highest cards in this section, and they are the final act in the End Times -- judgment and reward; 5) the three central subjects, Star, Moon, and Sun are identified by Jesus, in Luke 21:25, as the Signa Coeli by which the Second Coming would be known. Taken together, a 2/3/2 narrative can be seen which suggests what the designer might have been thinking. That is, if he wanted the two essential eschatological triumphs, and he also wanted to create a hierarchy of light by flanking the Signa Coeli with those two triumphs, (from Prince of Darkness to Lux Mundi) he would have had no better choices than those we see in actual decks. In other words, that proposed design is not only consistent with the highest subjects in a moral allegory and their use in a card game, but actually explains the choice of these seven subjects and their sequence. Dummett's hypothesis is perfectly reasonable and very difficult to refute, but not very explanatory. Most interpretations which are offered only deal with individual subjects taken out of context, or placed in a vague, hand-waving sort of context. A satisfactory explanation must attempt to make sense of the pieces, but not just individually -- the puzzle must be assembled. Otherwise, Dummett wins. If a cardmaker adds astrological imagery to several cards, not present in earlier versions of the same card, I would think an astrological context is also suggested. Apart from playing a game and learning a Christian lesson, there is also understanding the lesson in other terms, another way for us blind people to describe the elephant. as an object of contemplation. And there is the sheer joy of interpreting. One does not need to know that the gods associated with the months at Schifanoia have to do with Manilius, or what the middle figures there mean, to enjoy the art, but it's there to discover, and people did. I bring the same attitude toward the cards, in the context of the sequence and what the narrative might be in different frameworks--even though, to play the game, they aren't necessary. In fact it isn't necessary to know any extra-tarot narrative such as Revelation to play the game. That aside, the Christian one would seem to be the one that motivated there being three such cards (instead of one, perhaps representing Petrarchan Time). I am only trying to account for the Milan-based embellishments in narrative terms as well. Whether the embellishments in other decks can be fit into a meaningful, didactic narrative is another question, equally worth pursuing. Even if not, they are worth understanding in their own right, such as knowing that it is Diogenes and Alexander on the d'Este card. If a cardmaker adds astrological imagery to several cards, not present in earlier versions of the same card--the "occasion", as Michael puts it, I would think an astrological context is also suggested as part of what is there to be seen. Apart from playing a game and learning a Christian lesson, there is also understanding the lesson in other terms, another way for us blind people to describe the elephant. as an object of contemplation. And there is the sheer joy of interpreting. One does not need to know that the gods associated with the months at Schifanoia have to do with Manilius, or what the middle figures there mean, to enjoy the art, but it's there to discover, and people did. I bring the same attitude toward the cards, in the context of the sequence and what the narrative might be in different frameworks--even though, to play the game, they aren't necessary. In fact it isn't necessary to know any extra-tarot narrative such as Revelation to play the game. That aside, the Christian one would seem to be the one that motivated there being three such cards (instead of one, perhaps representing Petrarchan Time). I am only trying to account for the Milan-based embellishments in narrative terms as well. Whether the embellishments in other decks can be fit into a meaningful, didactic narrative is another question, equally worth pursuing. Even if not, they are worth understanding in their own right, such as knowing that it is Diogenes and Alexander on the d'Este card. Thanks to a post on ATF, I found this great 1491 astrological manuscript, in which many illustrations feature the brick wall background that appears in a few Sun cards. This one is from pg. 119. About the “hierarchy of light”, the 1688 edition of “Il Malmantile Racquistato” by Lorenzo Lippi contains some long footnotes by Paolo Minucci related to Minchiate cards. They have been published in Italian by Andrea Vitali and Girolamo Zorli. Mike Howard has translated into English part of the page. In queste carte di Tarocchi sono effigiati diversi geroglifici, e segni celesti: e ciascuna ha il suo numero, da uno fino a 35 e l' ultime cinque fino a 40 non hanno numero, ma si distingue dalla figura impressavi la loro maggioranza, che è in quest'ordine Stella, Luna, Sole,Mondo, e Trombe, che è la maggiore, e sarebbe il numero 40. L’allegoria è, che siccome le stelle son vinte di luce dalla Luna, e la Luna dal Sole, così il Mondo è maggiore del Sole, e la Fama, figurata colle Trombe, vale più che il Mondo; talmente che anche quando l'uomo n'è uscito, vive in esso per fama, quando ha fatte azioni gloriose. Il Petrarca similmente ne' Trionfi fa come un giuoco; perchè Amore è superato dalla Castità, la Castità dalla Morte, la Morte dalla Fama, e la Fama dalla Divinità, la quale eternamente regna. “In these tarot cards, various hieroglyphs and heavenly signs are represented. Each of them has its number, from 1 to 35, and the last five, until 40, are not numbered, but their ordering is understood from the figures printed on them. The order is: the Star, the Moon, the Sun, the World and the Trumpets, which is the highest and would be number 40. The allegory is that, as the Stars are won by the light of the Moon, and the light of the Moon by that of the Sun, in the same way the World is greater than the Sun, and Fame, represented by the Trumpets, is more valuable than the World; so much so that a man, after having exited the World, continues to live in it thanks to his Fame, when he has accomplished some glorious deed.